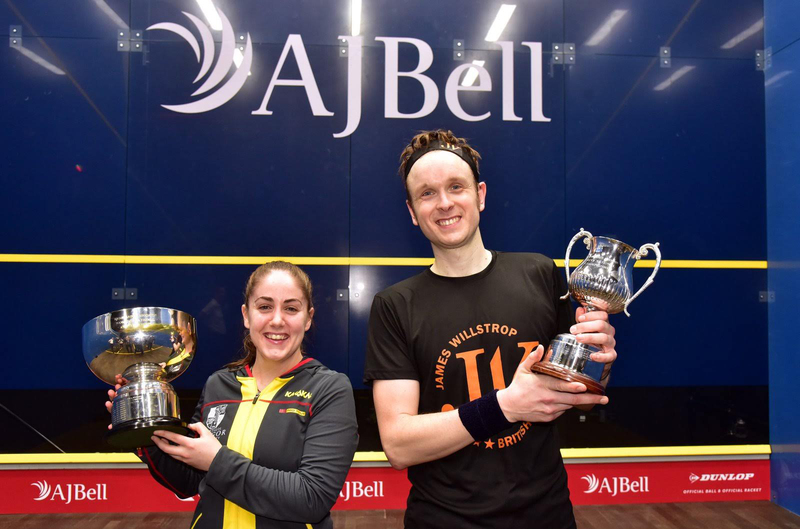 England’s James Willstrop and Wales’ Tesni Evans prevailed on finals day at the AJ Bell British National Squash Championships in Nottingham today after overcoming England’s Daryl Selby and Emily Whitlock respectively to lift the prestigious titles. 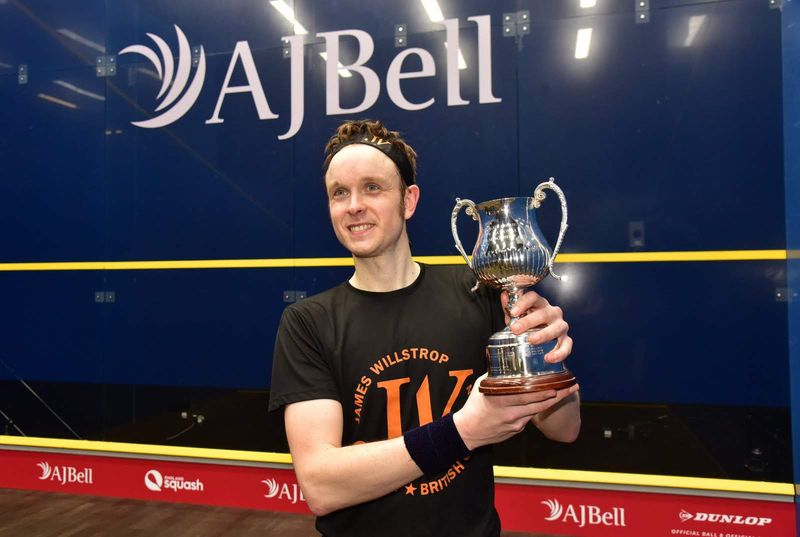 Yorkshire’s James Willstrop held off a stern challenge from second seed Daryl Selby to claim his third championship title with a 11-5, 7-11, 11-5, 11-7 victory. The 35-year-old opened the scoring with a stunning pick-up at the front to win a mammoth opening point, Selby responding in fine fashion moments later with a shot through his legs which brought the admiration of crowd and opponent alike. The pair traded points up to 5-5 in the opening game, Willstrop eventually closing it out to take the lead in the match with an 11-5 win. Former World No. 1 Willstrop seized control of the second game, racing into a 6-0 lead but Selby fought back with the grit and determination which had characterised his tournament. He levelled at 7-7 and took the momentum to level the match with his first game ball and an 11-7 win. The third game was closely fought and tense, until a let decision in Willstrop’s favour at 7-5 up seemed to swing the momentum his way. He reclaimed the lead in the match with an 11-5 win, again seizing the initiative with his first game ball. Selby had pulled up in pain at the end of the third game but his belligerence showed no sign of waning, both players having to earn every point in a fourth game of true quality. It was anybody’s game with Willstrop 7-6 up and grinding his way towards victory, but the mutual respect between the players was clear even with the stakes at their highest. Willstrop’s quality and experience shone through winning with his second match ball, the watching crowd having been treated to a true exhibition of a final. “It’s lovely,” said Harrogate-based Willstrop. “To achieve a big title like that with so many big players is fantastic. My body got through it. “It’s a huge title and a very special thing to be able to achieve, so I’m very, very happy. 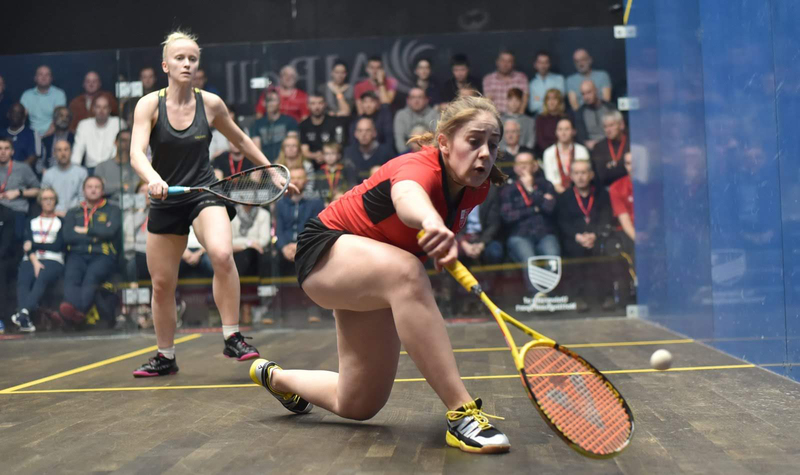 Defending champion Tesni Evans retained her crown with a dominant straight-games victory over fourth seed Emily Whitlock. Third seed Evans became the first Welsh player to win the tournament in 2018 and never looked like relinquishing her title this time around, winning 11-3, 11-6, 11-5 in 31 minutes. There was a distinctly Welsh feel to the final as Evans beat the Colwyn Bay-based Whitlock, who was appearing in her first final. Evans was the early aggressor in the match and took the first game in dominant fashion. After Whitlock had brought an early deficit back to 3-3, Evans forced the issue and took the lead with eight consecutive points, winning the opening game 11-3. Whitlock had shocked the number two seed Alison Waters in the semi-finals but she was powerless to resist on this occasion as Evans stretched her points streak to 14, storming into a 6-0 lead in the second. The underdog rallied and levelled at 6-6 but Evans regained her touch and took firm control of the match, taking the second game with her first game ball in an 11-6 win. The final game had a more back-and-forth feel to it as Whitlock fought tooth and nail, but Evans’ quality showed as she forced her way through to an 11-5 win. “It’s pretty special,” said Cardiff-born Evans, now based in Rhyl. “It makes it even more special that I can defend it and take it back to Wales, that makes it even better. “Last year was amazing to win it and I definitely didn’t think I’d be standing here after winning it again. “I tried to play as fast as I could and take the ball as early as I could and I think it maybe took her a little bit by surprise. Wales’ Tesni Evans fastened her grip on a consecutive British Nationals title today after overcoming Laura Massaro on the penultimate day of the AJ Bell British National Squash Championships in Nottingham. The defending champion, seeded third resisted a dominant start from top seed Massaro and set up a final showdown against England’s  Emily Whitlock. The 26-year-old bounced back from an early scare inflicted by the English stalwart to close out proceedings in emphatic fashion at 8-11, 11-1, 11-7, 11-8 in a match which lasted 50 minutes – despite nearly losing her nerve at 4-8 down in the fourth. Speaking after the match, Evans said: "Laura is one of the toughest players you can meet, it's always a right battle and today was no different. "At 4-8 in the fourth, I was thinking about the fifth, but managed to push through. "I'm just happy to be in the final and looking forward to another great match." Whitlock defied her seeding to oust second seed Alison Waters from the competition as the 25-year-old completed a 3-1 victory over her compatriot lasting 46 minutes. Whitlock enjoyed the brighter start, mounting an 11-8 lead to take the first game, before Waters resisted a brief fight back at 7-2 up to claim the second. 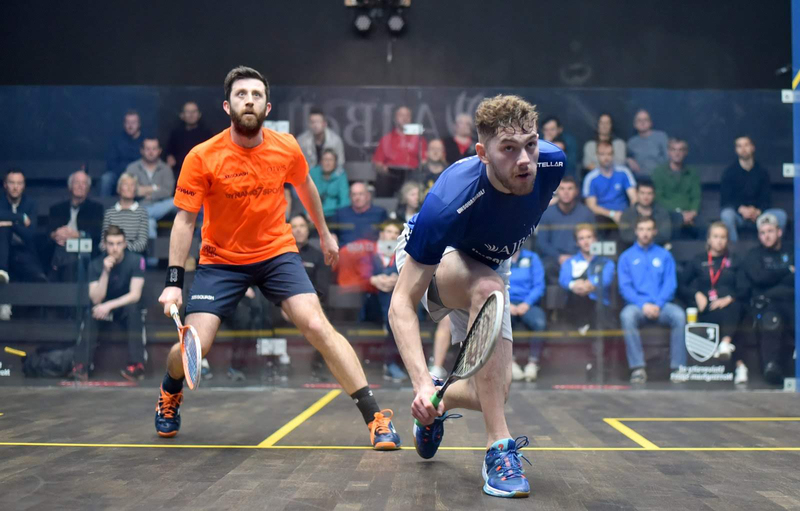 But the Cheshire hitter – who’s ranked 20 in the world – took control in the third, quashing Waters 11-3, before closing out the fourth in impressive style at 11-2. The result signals Whitlock’s best ever run in the competition, having bettered her semi-final finish in 2017 when she lost to Laura Massaro. On a day when both of the top two female seeds were sent crashing out of the tournament – the men’s draw favoured a different narrative – with both James Willstrop  and Daryl Selby  setting up a repeat of last year’s semi-final, where Willstrop prevailed. But their latest chapter en route to sealing a spot in the last round of the tournament couldn’t have been scripted any more different. 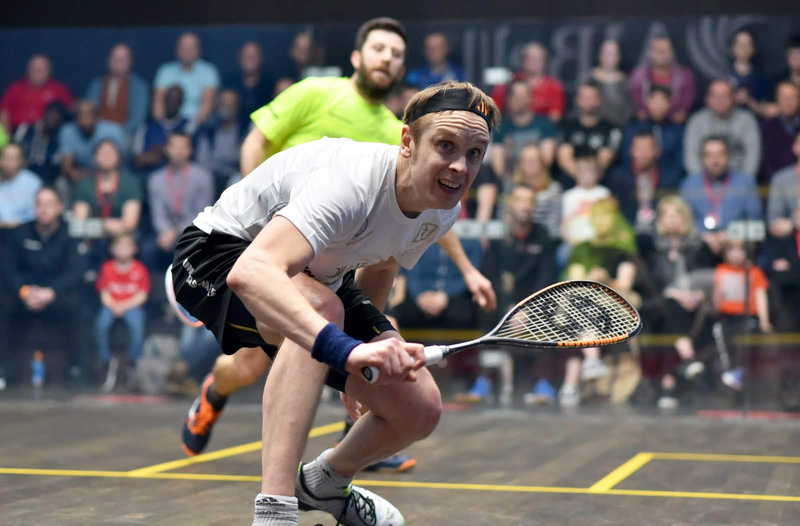 Two-time champion Willstrop fought back from a game down to overpower Scotland’s  Greg Lobban 9-11, 12-10, 11-6, 11-3 in just under an hour to reach his tenth national final. It means the Pontefract player will have the chance to claim his third tournament title – having come up short on six previous occasions as a finalist – the most recent against former England No.1 Nick Matthew last year. "Greg played really well in the first two," said Willstrop. "I couldn't break him down and he stopped me from getting chances to attack. It opened up later and I managed to get myself in front, but I had to stay with it in that period and stay alert to the end. "It's a big title to win, so to have another chance, and to be playing well at this crucial time of the season is a bonus. Daryl has had a hard route through but he's always a tough opponent and I'm sure we'll both be giving everything we have tomorrow." Second seed Daryl Selby, however, endured a third successive five-game slog in as many days after being forced to come from behind to oust Adrian Waller  and rack up a total of 262 minutes – or over four and half hours – of on-court action in the competition so far. Selby slipped to 8-11, 6-11 early on, but capitalised on a wave of momentum after claiming the third 11-7. It heralded another memorable comeback for the 2011 champion, who went on to clinch the remaining two games 11-5, 11-6 in an entertaining 77 minutes. Speaking after coming through another intense battle, Selby said: "I’m very happy to get through, it's not been an easy route! 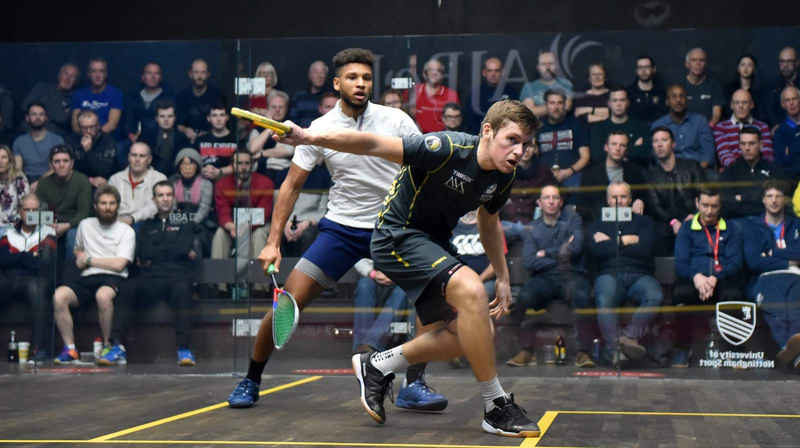 The second day of the AJ Bell British National Squash Championships in Nottingham saw Scotland’s Greg Lobban overpower England’s Richie Fallows in straight games and become the first Scot since John White in 2007 to reach the last four of the prestigious tournament. It took Lobban 49 minutes to overcome Fallows 11-5, 13-11, 12-10 and set up a semi-final showdown against top seed James Willstrop. 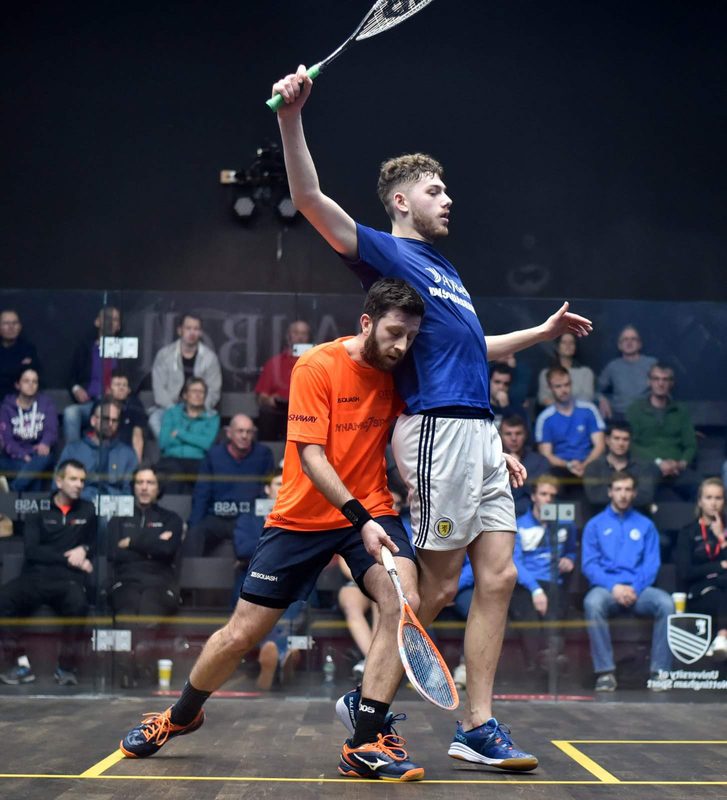 Meanwhile, second seed Daryl Selby survived a second successive marathon, grinding out a five-game victory over [5/8] Chris Simpson after an intense 98 minutes on court. The 2011 champion was pushed all the way by compatriot Simpson in dramatic style - levelling after 80 minutes in the nail-biting encounter to come through 7-11, 11-8, 12-14, 11-3, 11-8. Speaking after the match, Selby said: "Today I actually played very well. Simpo is very tenacious and an unbelievable retriever, he’s class. He doesn’t give an inch and therefore I didn’t give an inch. Selby will lock horns with [5/8] Adrian Waller who produced the day’s only seeding upset by overcoming [3/4] Tom Richards 11-4, 7-11, 17-15 11-3. "It was a tight match, the first two games went one apiece quite evenly,” said Waller. "The third game took the wind out of both of us but winning it gave me more confidence going into the fourth. Really pleased to win and get through to the semis." In the women’s draw, defending champion Tesni Evans remains on course for a consecutive national crown after overcoming [5/8] Julianne Courtice 8-11, 11-5, 11-5, 11-7 and set up an intriguing semi-final encounter with England’s Laura Massaro. Massaro overcame a stern test from compatriot [5/8] Millie Tomlinson winning 6-11, 11-4, 11-9, 11-8 (52m) to seal her last four spot. Meanwhile, second seed and four-time champion Alison Waters dispatched fellow compatriot [5/8] Fiona Moverley in three to set up a last-four showdown with [3/4] Emily Whitlock, who enjoyed a straight games victory over Kace Bartley in under half an hour. 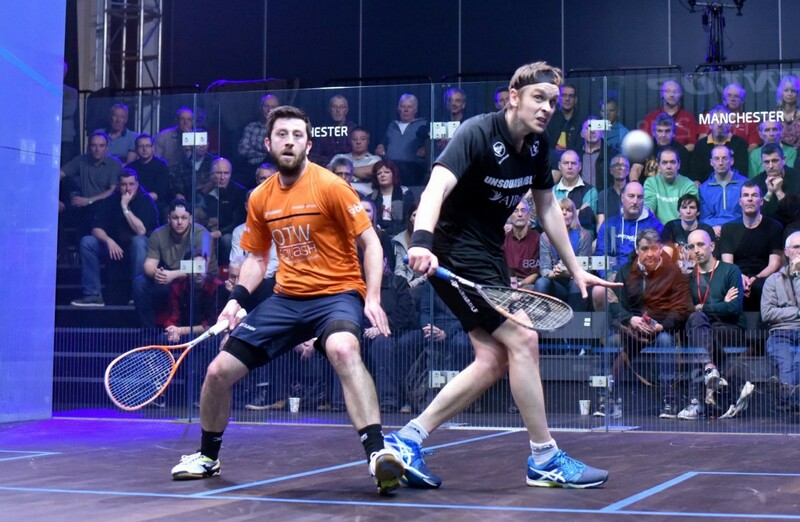 England’s Daryl Selby survived an epic scare in the first round of the AJ Bell British National Squash Championships, fighting from 2-0 down to overcome Scotland’s Rory Stewart: 9-11, 12-14, 11-6, 11-9, 11-8. The pair fought it out on court for a gruelling 87 minutes which saw 2011 champion Selby hold his nerve at 4-9 down in the fourth to book a quarter-final tie against England’s Chris Simpson [5/8]. Speaking after the intense encounter, Selby hailed Stewart as a “dangerous player” but admitted he was pleased with the grit and determination he showed en route to clinching a victory which early on, looked seemingly unlikely. Tom Richards (Eng) [3/4] also needed five games to see off Patrick Rooney (Eng) after storming back from a two-game deficit to claim a 7-11, 6-11, 11-2, 11-6, 11-4 triumph and set up a last-eight clash with Adrian Waller [5/8]. But there was no early scare for top seed James Willstrop who made quick work of dispatching fellow Englishman Harry Falconer, with the Commonwealth Games gold medalist cruising to a straight game victory in just 22 minutes to set up a quarter-final with Nathan Lake (Eng) [5/8]. 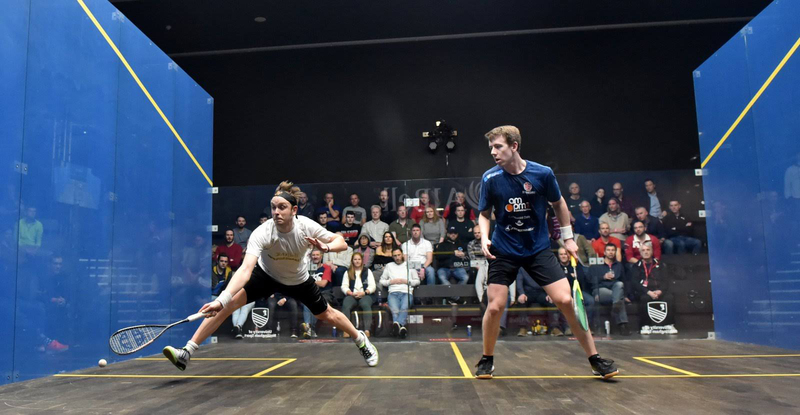 “If it’s any consolation to Harry, that’s about as good as a 20 minutes of squash as I’ve ever put together, everything was working – even the lucky shots,” said Willstrop after the game. Meanwhile, Greg Lobban [5/8] remains the only non-Englishman left in the draw, who will face Richie Fallows (Eng) – the only unseeded player to remain in the men’s competition. The opening day of the women’s draw saw no major upsets as top seed and seven-time finalist Laura Massaro once again underlined her dominance on home turf to book her place in the last eight, overcoming a valiant effort from Scotland’s Alison Thomson with an 11-5 11-8 11-4 victory. The four-time champion will face England’s Millie Tomlinson [5/8] in tomorrow’s quarter-final. Speaking after the match, Massaro said: “I’m pretty happy with my performance overall and I’ll try and build on that tomorrow. “It was my first competitive match on that court so it was great to get a win under my belt. Welshwoman Tesni Evans [3/4] remains on course to defend her British Nationals crown after reaching the quarter-finals with a comprehensive victory over English qualifier Alicia Mead – winning 11-2, 11-2, 11-5 in just 23 minutes. The result means Evans – who last year became the first Welsh champion in the tournament’s history – could meet Massaro in a repeat of last year’s semi-final. But first Evans will lock horns with France’s Juliette Courtice [5/8] in the last eight, while second seed Alison Waters (Eng) overcame a feisty challenge from Scotland’s Georgia Adderley 11-5 11-7 11-4 to face Fiona Moverley (Eng) [5/8]. Elsewhere in the draw, Kace Bartley overpowered English youngster Lucy Turmel [5/8] in a high-scoring 12-14, 16-14, 11-9, 11-4 encounter to fix a quarter-final tie with Emily Whitlock (Eng) [5/8]. In what promises to be one of the most hotly contested championships in recent years, four former British National champions currently ranked inside the World’s top ten will battle it out for the prestigious women’s title at Nottingham Squash Rackets Club and the University of Nottingham from 14-17 February. Joining the England No.1 are four-time National champions  Laura Massaro and [3/4] Alison Waters ranked 7 and 9 in the world respectively. Looking to defend her crown is Welsh No.1 [3/4] Tesni Evans whose record-breaking 2018 saw the 26-year-old become the first Welsh player ever to win the Nationals and break into the World’s top ten rankings. 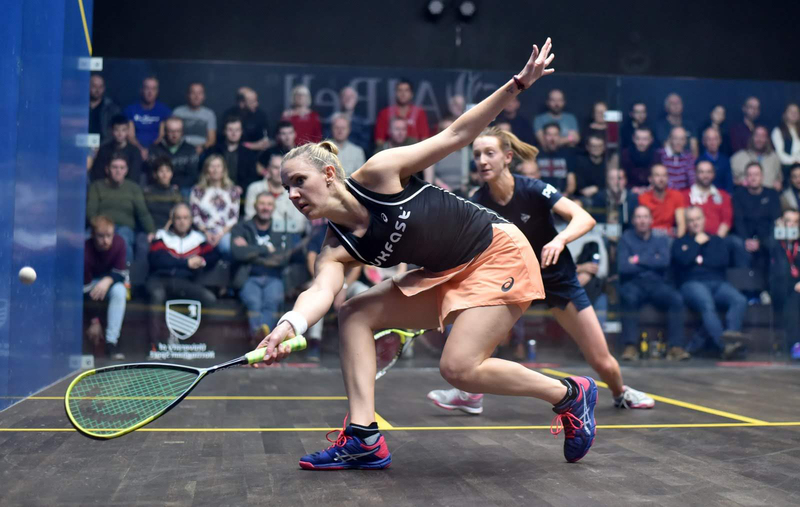 Hot on their heels and all capable of causing an upset is a quartet of young English players seeded [5/8] including World No.21 Emily Whitlock who lifted the biggest title of her career in September at the NASH Cup. Likely to cause a serious upset is World No.25 Millie Tomlinson, the current European champion who overpowered eight-time World Champion Nicol David in November’s Hong Kong Open. Joining Whitlock and Tomlinson is World No.15 Victoria Lust who will be striving to advance into her first final after reach the semis in 2015. Similarly, World No.26 Fiona Moverley will be eager to advance to the last four after bowing out in the quarter-finals for the last four consecutive years. The women's qualifying event will take place on 12th and 13th February at Nottingham Squash Rackets Club with the top four advancing to the main draw.